Resource guarding is normal animal behaviour. It is adaptive, so from an evolutionary point of view, animals will do it because it helps them stay alive and reproduce. You lock your car or your house when you leave it - that's our way of trying to prevent others getting our stuff! All dogs will show resource guarding at some level. The problem is, that some dogs may exhibit inappropriate manifestations of RG with behaviours that may lead to harm. I do believe, in my experience, that gundogs in general and Cockers, Goldens, CKCS, and Springers (to a lesser extent) are more prone to this level of RG. I see A LOT of cases where behaviour has been motivated by RG, and a risk factor from my caseload are dogs that are more oral - like to have things in their mouths etc. Also, RG is proximity related, so these dogs may often show discomfort in proximity related contexts, e.g. grooming, handling etc. That's just one of the differentials to be explored. Also, a range of medical differentials may contribute. For example, GI issues may lead to pica, coprophagia and RG - all of which can be related. So, behaviour having a genetic basis is not the same as saying that behaviour is genetic. And that's because so much of the expression of a trait is down to environmental conditions. In my field, we say that behaviour is NOT in the dog, but in the environment. I.e. describe what the dog is doing, not what the dog is. For the most part, the dog carries out behaviour that he feels is appropriate due to particular environmental conditions. And of course, who's responsible for those environmental conditions - yep! the humans. All of the humans involved in the decisions to produce a puppy, to rear a puppy, to take a puppy home, to live with and rear the dog, and so on. But, before you despair, that also means you have the power to control and change the dog's environment. Canine RG is typified by specific sets of signalling. The dog wants you (or whatever he perceives to be a threat to possession) to move away and leave him with access to his thing. The function of RG related behaviour is to get you to move away, and for the dog to keep their thing. It's distance increasing signalling. Dogs have a HUGE vocabulary of non-confrontational distance increasing behaviour. They want to give you lots and lots and lots and lots of chances to move away, before they must resort to more agonistic behaviour, e.g. threat signalling. Even when dogs do aggress, they very very very rarely demonstrate behaviour that results in serious injury to humans. Given that dogs have equipment made for killing other animals, they very rarely use uninhibited force toward humans. Therefore, humans will generally have many ops to move away and leave the dog alone. But, we being primates, and dogs being dogs, miss lots of it and dogs feel they have no other option but to shout a little louder. For the most part, pet owners notice an issue when they see freezing, growling, snarling, snapping and biting. If the dog is doing that, it's terribly likely that they have been signalling more subtly for a very long time. First thing, we need to know what we are dealing with. So we collect history info and data about the behaviour to determine that it's RG we are dealing with, or not. And we want to know lots of info including how long it's been going on for, how much protracted warning the dog shows, proximity to threat/resources etc., bite level and bite threshold, what's guarded, when is RG behaviour shown, what's the function for the individual dog and context, and so on. 1. Management - this means to prevent the dog being put in situations where they practice unwanted behaviour. The most important step! From our data collection, we not know what sort of situations RG behaviour happens - let's avoid 'em! Make sure that the dog has a confinement area in which it's safe for him to eat etc. where nobody disturbs him and he can stop looking over his shoulder. This needs to be in place long term. No taking stuff off the dog, no hovering around the dog. 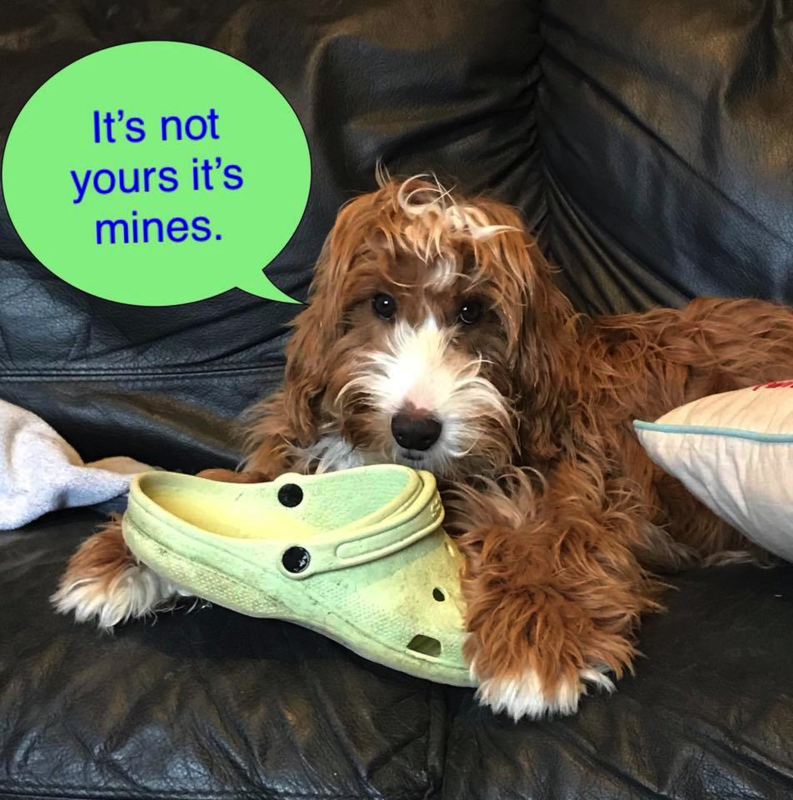 Management in relation to stealables is important - value of the item is increased if the dog's not supposed to have it, or if they rarely get it etc. so guarding more likely. 2.Providing the dog with acceptable outlets. RG behaviour fulfills some function for the dog and by putting management in place we may be stopping that as an outlet for the dog’s behaviour. With RG, it is generally more likely to be seen and/or intensified when the dog is experiencing exposure to stressors. RG is about control – stress is about feeling as if you are losing control and predictability. We need to look at the dog’s ability to recover from stress, build self-calming skills and work on arousal control. We want to make sure the dog has acceptable outlets for scavenging behaviours – dogs are scavengers and living with us isn’t going to change that! Getting dogs sniffing and working for food in low key ways will be important. Making sure the dog has outlets for physical and mental stimulation is vital. Given that most breeds of dog were developed by selecting for traits associated with being sensitive to environmental change and being quick to arousal, it’s not wonder many pet dogs suffer as a result – it’s hard to be a modern pet dog! Change how the dog feels about the proximity to humans, when he has something. From wanting to get rid of you to “it’s awesome when people come near, when I have stuff” is key. This takes time, to develop new associations. This involves making sure to never put the dog in a situation (i.e. get close enough to trigger) where he feels RG behaviour is required. Teaching the dog that when he has something and people are nearby, to offer an incompatible behaviour, for example, move away from the resource. Leave it for never getting a thing, and thank you for getting a thing back willingly. Note I tend not to do trading. I find that pet owners rush this and the dog isn’t ready. All we end up doing is to teach the dog that they are going to lose their thing when humans are really close up. That puts people at risk. If a dog gets something they shouldn’t (cos human failed to maintain management) then I prefer to create a diversion or ideally ignore the dog. If we make a big deal out of it, it becomes a big deal! Larry the Cocker Spaniel was protective over his soft toy. Anne demonstrates the use of positive rewards to access the soft toy. What about dog to dog Resource Guarding ?